The Yankees are hiring recently retired ballplayer Carlos Beltran to a front office role, per MLB.com’s Mark Feinsand (via Twitter). Beltran will serve as a special advisor to GM Brian Cashman. Last we heard, Beltran had declined a similar opportunity with the New York club last offseason. At the time, of course, he had only just wrapped up his illustrious, two-decade MLB career. Beltran certainly was entitled to some time away from the game, but it has long seemed he’d remain engaged in some capacity. Indeed, the Yanks even considered him for their open managerial post, with Beltran indicating real interest in that demanding job. It’ll be interesting to see what path the 41-year-old Beltran takes in his post-playing career, which is only just getting under way. As Feinsand notes, one of his first assignments could well be to help the Yanks lure Manny Machado, who shares an agent with Beltran. After the announcement that Joe Girardi won’t be back to manage the team in 2018, the Yankees are now looking for just their third skipper in the last 22 seasons. The new manager will step into an enviable situation, taking over a team with one of the sport’s biggest payrolls and an array of young star talent, though there will be immediate pressure on the new dugout boss to win. Eight years without a World Series counts as a major drought by the Yankees’ standards, and since the current roster finished just a game shy of the AL pennant, there is reason to believe this group is ready to win now. As with previous managerial searches, we’ll keep a running post on any news and rumors connected to possible candidates for the Yankees’ job. The Yankees are not limiting themselves to the five candidates that are known to have interviewed, ESPN.com’s Jim Bowden reports (Twitter links). That seems to introduce a bit of a wild card to the search at this stage. How many additional candidates might get interviews isn’t known, but there seems to be at least one name already on the list for a sit-down. Beltran, who is discussed further below, will be brought in for a closer look, according to Steve Phillips of MLB Network Radio on Sirius XM (via Twitter). Broadcaster Aaron Boone and Giants coach Hensley Meulens have each had their interviews, as Joel Sherman of the New York Post reported would take place. Boone’s candidacy was first reported by ESPN.com’s Buster Olney (via Twitter). The long-time big leaguer, who spent a small but memorable portion of his career with the Yankees, does not have any big league coaching experience. Meulens is also a former Yankee player; Sherman first called him someone “who could come into play” for the job. The Yankees have interviewed former Mariners and Indians skipper Eric Wedge for the post, tweets ESPN New York’s Andrew Marchand. The 2007 American League Manager of the Year, Wedge hasn’t been in a big league dugout since the 2013 season — his final in Seattle. Since that time, he’s spent two seasons as an analyst with ESPN and another two working with the Blue Jays’ player development department. He’s currently a field coordinator in the Toronto organization. Bench coach Rob Thomson sat down with the organization about the managerial opening on November 8th, according to Ken Rosenthal of The Athletic (via Twitter), though it doesn’t seem as if he faced the press afterward. Thomson has been on Girardi’s staff since 2008 and previously worked in the Yankees’ player development department. If Boone was an unexpected candidate, then the most recent possibility to be floated comes straight from left field — almost literally. Even as he announced the end of his playing career today, Carlos Beltran was generating buzz in relation to the Yankees managerial opening. In interviews with MLB.com’s Mark Feinsand and ESPN.com’s Marly Rivera, Beltran said he wants to manage (at least eventually) and suggested he’d have interest in the gig. Cashman did not commit to anything when asked to comment, saying that he’s “aware of [Beltran’s] interest in managing in the future” but declining to elaborate otherwise on the matter. Carlos Beltran tells Joel Sherman of the New York Post that he had a “brief conversation” with GM Brian Cashman and that he has a desire to apply his knowledge and passion for the game to a managerial role in the Majors. Beltran also indicated that he hasn’t been asked to come in for an interview, though, and Sherman suggests that the Yankees may only interview one or two additional candidates for the position, casting some doubt as to whether Beltran is truly a possibility. Former major league infielder/outfielder Jerry Hairston Jr. is a potential candidate, Ken Rosenthal of The Athletic hears (Twitter link). Hairston was a member of the Yankees’ most recent World Series-winning team in 2009, but he doesn’t bring any coaching experience to the table. Interestingly, though, former ESPN.com writer Mark Saxon noted back in 2013 that managing could be in Hairston’s future. As Saxon detailed, Hairston is fluent in Spanish – a valuable asset for a manager – and, at the time, was a mentor to some of his younger teammates on the Dodgers. That season went down as the last of Hairston’s playing career. The 41-year-old has been working as a Dodgers broadcaster since retiring in December 2013. Per Sherman and MLB.com’s Bryan Hoch, some of the internal candidates likely to receive consideration include bench coach Rob Thomson, first base coach Tony Pena, minor league hitting and baserunning coach Reggie Willits, and minor league managers Al Pedrique (Triple-A), Jay Bell (advanced A-ball) and Josh Paul (short season A-ball). The Yankees asked the Athletics for permission to speak with manager Bob Melvin, but were not given authorization, per Ken Rosenthal of The Athletic (via Twitter). Former Yankee outfielder and current Dodgers special adviser Raul Ibanez was mentioned by both Sherman and Hoch. But he decided not to pursue the position after being contacted, Ken Davidoff of the New York Post tweets. Recently fired Tigers manager Brad Ausmus also declined a chance to interview, per Jon Heyman of Fan Rag (via Twitter). Josh Paul isn’t considered a candidate, according to George A. King III of the New York Post. Kevin Long was initially cited by Sherman as “a long shot,” but has since signed on to become the Nationals’ hitting coach. Yankees VP of baseball operations Tim Naehring tells ESPN.com’s Andrew Marchand that he isn’t interested in being considered for the job. Naehring has worked almost entirely in front office capacities for the Reds and Yankees since he retired from playing, and Marchand suggests that Naehring is a future GM candidate for other teams. The Yankees have not contacted the Marlins about manager Don Mattingly, as Barry Jackson of the Miami Herald reported. Miami has announced more recently that Mattingly will remain with the organization as manager. The idea of Alex Rodriguez becoming the Yankees’ manager is “the longest of long shots,” according to Hoch. Given the controversy and hard feelings that seemed to accompany A-Rod’s final years in New York, Rodriguez would indeed seem like a very unlikely fit, especially given how he has seemingly moved onto a new career in broadcasting. Yankees GM Brian Cashman discussed the search with reporters, including MLB.com’s Bryan Hoch. Cashman said that the organization prefers a “fresh voice” to connect with its young players, indicating that Girardi wasn’t the man to improve “the connectivity and the communication level of the players in that clubhouse.” The veteran executive says he did not enter the search process with a list of candidates already prepared, suggesting it’s a wide-open search. Interestingly, as Joel Sherman of the New York Post reports (Twitter links), the plan is for candidates to meet with the media — in part, perhaps, as part of the evaluation process. And though Cashman says he may in the past have sought out employees with whom he had previously worked, he notes that won’t be a “driving force” in this case. Sherman previously discussed that potential factor. Carlos Beltran will retire after spending parts of 20 seasons in the Majors, he announced today via The Players’ Tribune. The former AL Rookie of the Year and nine-time All-Star won his first World Series championship with the Astros in 2017 and will end a likely Hall of Fame career on that high note. Beltran made his Major League debut at the age of 21 with the Royals in 1998 and made a strong first impression in a small sample of 14 games. He burst onto the scene a year later with a .293/.337/454 batting line, 22 homers, 108 RBIs and 112 runs scored en route to American League Rookie of the Year honors. A knee injury limited Beltran to just 98 games in 2000, but he cemented himself as one of the game’s top young stars with a brilliant, healthy campaign in 2001. Beltran remained in Kansas City until the 2004 season when the Royals sent him to the Astros in a three-team trade that netted them Mark Teahen and John Buck. Beltran, who had earned his first career All-Star nod that season, starred for the ’Stros down the stretch before delivering one of the most incredible postseason performances in MLB history that year. Houston topped Atlanta in the NLDS and took the Cardinals to Game 7 of the NLCS, and in those 12 games Beltran put the Astros’ offense on his back; in 56 trips to the plate, he batted a ridiculous .435/.526/1.022 with eight home runs, three doubles, 21 runs scored and 14 RBIs. That offseason, Beltran inked a seven-year, $119MM contract with the Mets — the largest in franchise history at the time — where he continued to build on his Cooperstown resume. Beltran made the All-Star team in each of his first three seasons with the Mets (and five of his seven overall), and he turned in yet another memorable playoff performance in 2006. While many remember Beltran being frozen at the hands of an Adam Wainwright curveball to close out Game 7 of that NLCS, Beltran’s greater contributions to that outstanding series came in the the form of a 1.054 OPS and three homers in just 31 plate appearances. Overall, he batted .280/.369/.500 in six and a half seasons with the Mets before being traded to the Giants in exchange for Zack Wheeler. Beltran went on to sign a two-year, $26MM contract with the Cardinals that offseason, making two more All-Star teams and two more excellent postseason appearances. He parlayed his .282/.343/.493 triple slash in two St. Louis seasons into a three-year, $45MM contract with the Yankees. With the Yankees, he received one final All-Star nod (in 2016) and appeared in the 2015 Wild Card game before being flipped to the Rangers a 2016 trade that sent former first-rounder Dillon Tate to New York. Beltran remained an above-average hitter all the way through that run in Texas, hitting a combined .271/.327/.468 over the life of that three-year deal. Beltran and his wife, Jessica, started a fund to aid in Puerto Rico’s recovery and made an initial donation of $1MM, and he also founded the Carlos Beltran Baseball Academy in Puerto Rico back in 2011 — a bilingual high school emphasizing education in addition to athletics. All told, Beltran’s remarkable career will come to a close with a lifetime .279/.350/.486 batting line, 435 home runs, 1582 runs scored, 1587 RBIs, 312 stolen bases, nine All-Star appearances, three Gold Gloves, two Silver Sluggers, a Rookie of the Year trophy and a World Series ring. In addition to a superlative body of work in the regular season, he batted .307/.412/.609 with 16 home runs in 65 playoff games (256 plate appearances), making him one of the most decorated postseason batters of all time. He should have one more accolade let to add to the ledger when his name is immortalized among the all-time greats in Cooperstown. Beltran earned roughly $222MM, per Baseball-Reference, over the life of a career that both B-Ref (69.8 WAR) and Fangraphs (67.2 WAR) consider to be among the absolute best of the past of the past two generations (before even attempting to value his considerable postseason accomplishments). Congratulations to Beltran — one of the best we’ll have the privilege of watching in our lifetimes — on an exceptional career. Two weeks ago, the Dodgers were leaning toward having left-hander Julio Urias open the season in their rotation. It now appears he’ll begin in the minors as they attempt to tamp down his workload, according to Joel Sherman of the New York Post. The 20-year-old phenom threw a career-high 122 innings between the majors and minors in 2016, and LA wants to keep him fresh this season for a potential playoff run. Should the Dodgers send down Urias, they’d choose among Brandon McCarthy, Alex Wood and “wild card” Hyun-Jin Ryu to fill their final two rotation spots, adds Sherman (Twitter links here). When he accepted the Royals’ two-year, $12MM guarantee as a free agent last month, southpaw Travis Wood seemed like a decent bet to start 2017 in their rotation. But another offseason acquisition, trade pickup Nate Karns, has emerged over Wood and Chris Young as the clear favorite for Kansas City’s last starting spot, tweets Sherman. The right-handed Karns, 29, made 46 starts with the Nationals, Rays and Mariners from 2013-16 and logged a 4.19 ERA, 9.0 K/9 and 3.69 BB/9 over 249 innings. The 30-year-old Wood worked solely as a reliever with the World Series champion Cubs last season, which came after he racked up 133 starts in Cincinnati and Chicago from 2010-15. He recorded the same ERA as Karns (4.19) to go with 7.11 K/9 against 3.15 BB/9 during that 776-inning span. Free agent reliever Eric Gagne, 41, is making a case for a contract in the World Baseball Classic, though the Team Canada righty and 2003 NL Cy Young winner realizes he’d first have to succeed in the minors to have any chance at returning to the majors. “I know the game, I know how it happens, I know they need spots on the 40-man roster and don’t want to release a young guy for a 41 year old, so of course I’d be willing to do anything,” the former closer told Shi Davidi of Sportsnet. Gagne, who hasn’t pitched in the bigs since 2008, worked out for five teams before the WBC, writes Davidi, and has since fared well in the tournament. “Words are irrelevant at this point. Clubs are seeing it with their own eyes,” Gagne’s agent, Scott Leventhal, told FanRag’s Jon Heyman (Twitter link). Free agent designated hitter/first baseman Edwin Encarnacion has three preferred landing spots – the Blue Jays, Red Sox and an unidentified team – a major league source told Rob Bradford of WEEI. The mystery club isn’t the Yankees, per Bradford, and they’re likely out of the running for Encarnacion (if they were ever in it) after adding Matt Holliday. The Blue Jays could be out, too, as they’ve reached deals with two first base/DH types in Kendrys Morales and Steve Pearce this offseason. The fact that Toronto moved on to other options so quickly after Encarnacion rejected its four-year, $80MM offer came as a surprise to the longtime Jay, tweets Jon Morosi of MLB Network. Despite reported interest in Holliday and now-Astro Carlos Beltran, Boston didn’t make offers to either, Red Sox president Dave Dombrowski told Peter Abraham of the Boston Globe. “I figured we would wait to see what takes place later on, who’s out there. Our priority is to try to get a guy that can pitch the eighth inning for us,” said Dombrowski, who’s working with a limited amount of spending room because of a desire to stay under the $195MM luxury-tax threshold. “There’s a little bit more of a drive to [stay under]. But I can’t tell you where we we’re going to end up,” he stated. “There are penalties attached that I would rather not be in a position that we have to incur.” That would seem to rule out any possibility of Encarnacion to Boston, which already looked unlikely entering Monday. As for the bullpen, Dombrowski is unsure whether he’ll acquire a setup man via trade or free agency, but he hasn’t ruled out re-signing either Brad Ziegler or Koji Uehara. The Yankees are one of “several” teams engaging in “ongoing” dialogue with free agent infielder Luis Valbuena, his agent, Steve Schneider, told Joel Sherman of the New York Post. The Bombers have so far balked at the demands of Valbuena, who is seeking a multiyear deal and wants an everyday role. New York won’t be able to offer a daily place in its lineup to Valbuena unless it deals third baseman Chase Headley, but the club hasn’t had any luck doing that. 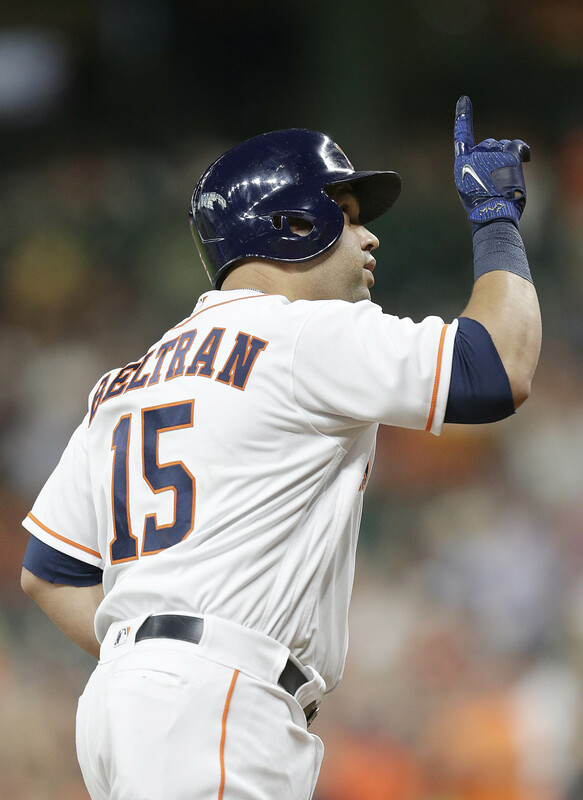 Valbuena, 31, spent the previous two years in Houston and is coming off his third straight strong offensive campaign, though his season ended in August because of hamstring surgery. The Blue Jays continue to have interest in acquiring outfielder Jay Bruce from the Mets, but they’re “offering little,” relays FanRag’s Jon Heyman (Twitter link). Toronto nearly acquired Bruce from Cincinnati last offseason, but the deal fell apart and he went on to hit .250/.309/.506 with 33 home runs in 589 plate appearances with the Reds and Mets. New York is now likely to move Bruce, who will make $13MM next season in the final year of his contract. The Marlins are “looking outside the organization” for a backup catcher to replace now-Diamondback Jeff Mathis, team president Michael Hill said Monday (Twitter link via Spencer). A.J. Ellis came up as a possibility Monday. 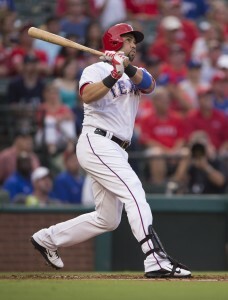 DEC. 5: The Astros announced that Beltran has passed his physical, making the contract complete. DEC. 3: The Astros have agreed to a one-year, $16MM deal with free agent DH Carlos Beltran, ESPN’s Buster Olney writes (Twitter links). Beltran is an MVP Sports Group client. Beltran will receive a no-trade clause, Bob Nightengale of USA Today tweets. Mark Feinsand of the New York Daily News had previously tweeted that Beltran would sign today. Since Beltran was traded last season, the Yankees could not extend him a qualifying offer, and thus the Astros will not have to sacrifice a draft pick. The Astros had repeatedly been connected to Beltran, and earlier this week it emerged that they were confident they could sign either Beltran or Edwin Encarnacion. The Red Sox, too, reportedly were very strongly interested in signing Beltran. The Yankees looked like a possibility as well, although Feinsand tweeted today that they were out of the running. Beltran agreeing to terms with Houston could pave the way for the Yankees to sign Encarnacion, though, as FOX Sports’ Jon Morosi tweets. In Houston, Beltran will join a new-look Astros lineup that also now features catcher Brian McCann, left fielder Nori Aoki and right fielder Josh Reddick. Those three veterans will join a young core that includes Carlos Correa, Alex Bregman and George Springer, alongside top second baseman Jose Altuve. Before the Beltran deal, Evan Gattis had been slated to fit in with the Astros at DH, and the Astros recently exercised their $5.2MM option on him. Gattis is coming off a strong season in which he hit .251/.319/.508 with 32 home runs. His exact role with the 2017 Astros is unclear, but he figures to catch sometimes (playing while McCann sits), while also sometimes playing corner outfield or DH’ing on days in which Beltran plays in the field. Beltran turns 40 in April, but he showed no signs of slowing down last season, batting .295/.337/.513 with 29 homers for the Yankees and Rangers. That hitting line placed him among the game’s better designated hitters — the only ones who were markedly better were David Ortiz, Nelson Cruz and Encarnacion. The switch-hitting Beltran was particularly deadly against lefties, batting .338/.380/.589 with nine homers in 163 plate appearances, but he also hit righties well. Beltran no longer has the baserunning or defensive value he did as a young man, but his skills at the plate have aged remarkably well, as he’s topped an .800 OPS in five of the last six seasons. Beltran now has 421 home runs in a career that stretches all the way back to 1998. In that span of nearly two decades, he’s played with both Astros manager A.J. Hinch (with the Royals in 2001 and 2002) and bench coach Alex Cora (with the Mets in 2009 and 2010). Jake Kaplan of the Houston Chronicle tweets that Hinch and Cora’s familiarity with Beltran might have played a role in the Astros’ decision to acquire him. This will be Beltran’s second stint with the Astros — he hit .258/.368/.559 with 23 homers with them down the stretch in 2004. MLBTR ranked Beltran the 33rd-best free agent available this offseason and predicted he would get a one-year, $14MM deal. The $16MM Beltran will receive next season is a slight raise on the $15MM per season he received on his previous three-year deal with the Yankees, and is the same as the amount Ortiz received in both 2015 and 2016.